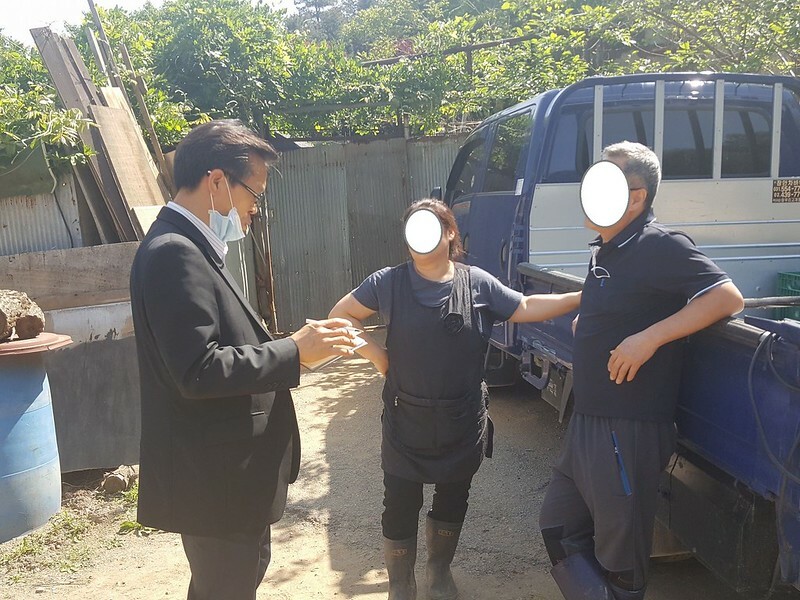 On May 13, 2016 Nami Kim, her team, and the city of Bucheon’s animal welfare official visited a large dog farm where 300 dogs were being bred for meat. They are trying to negotiate a release of all the dogs but the dog farmer wants compensation. Below are stories and videos from this visit shared by Nami Kim and her team on their Facebook post dated May 13, 2016. The wire cages never seem to end. Behind the two wire cage buildings we observe another long stretch of wire cages with more dogs, roughly totaling 300 dogs in all, including newly born pups. There is a slaughterhouse within the walls of the facility (too graphic to show) with no sewage which is illegal. I can charge them for violating the environmental law with a minimum of four code violations. ► Click HERE for the Nami’s Facebook post! 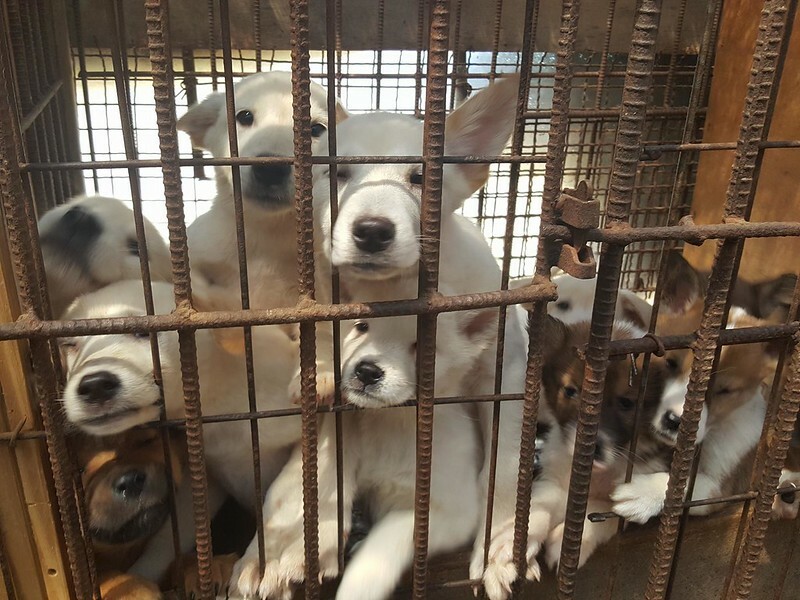 More than half of the dogs are a Jindo mix of less than 6 months old. I presume the owners have been breeding the dogs. 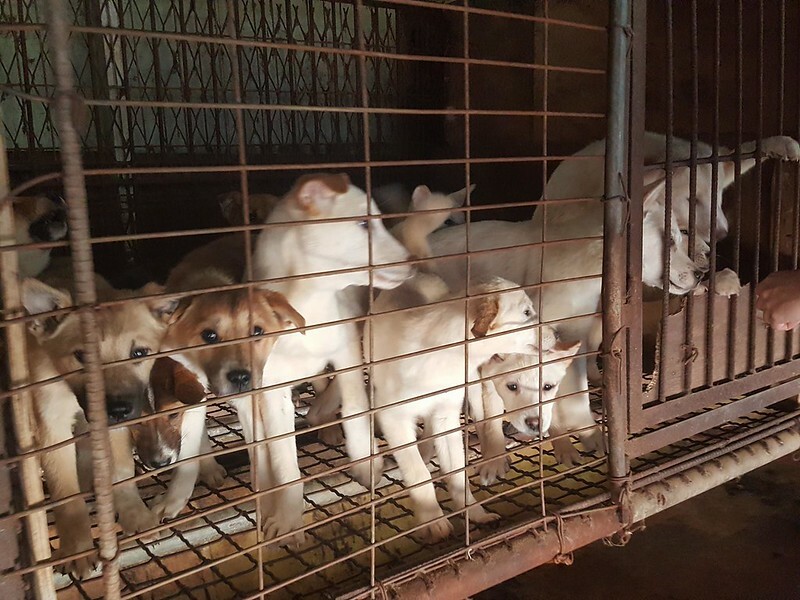 Our negotiation to surrender the dogs and close the dog farm went on in the presence of Mr. Kim, the city official. The owners of the dog farm appear fearful of paying the heavy fine they are subjected to under the many violations of the environmental law, and yet they continue to want something in return on the condition of an “all release” to us. I can see more than a dozen dogs are housed in each cage. I counted them from where I stand. There are four sections of long wire cages stretched out within the facility. 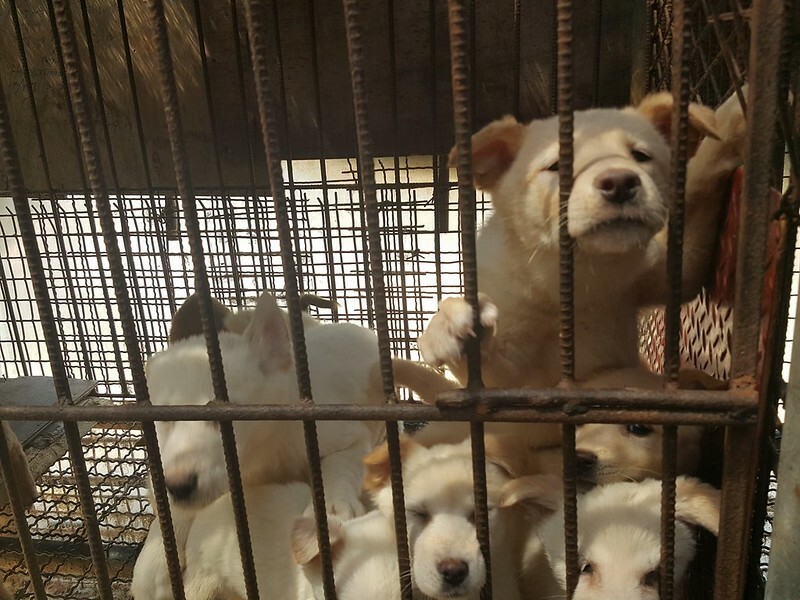 Donate to help Nami Kim and her team continue their rescues and campaign! The sign board at the dog farm was taken down in our presence. It says, “We sell dog meat in small pieces” and displays the telephone number of the business to order the meat. 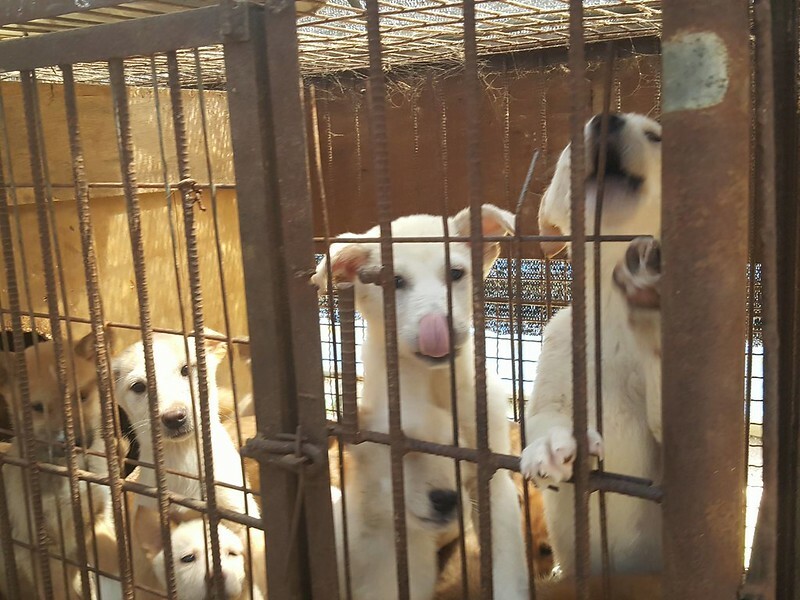 Negotiation is ongoing but as of today and going forward they will not slaughter the dogs. Mr. Kim, the city official, played a significant role here today. 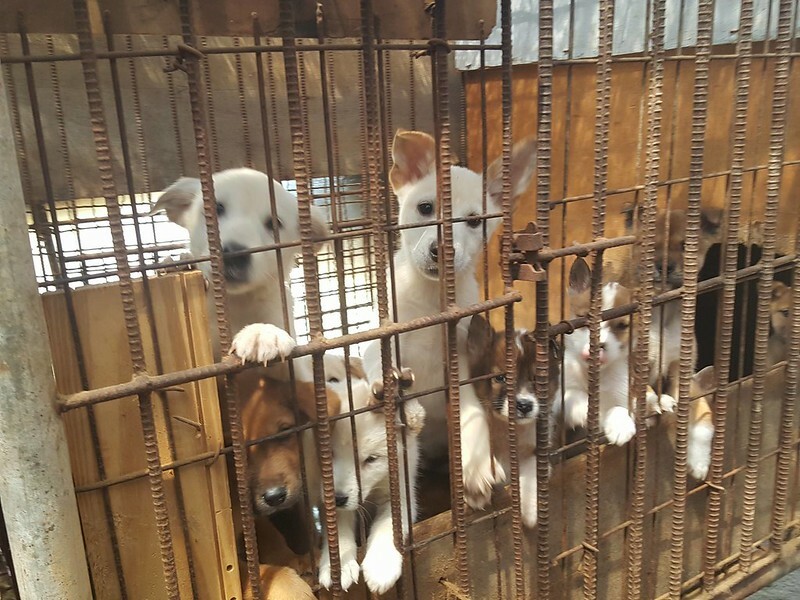 If negotiations are successful we will end up with 300 dogs when this dog farm closes its doors. There are roughly 100 dogs in each of three lots of wire cages stretched out in what seems like all directions. The “butcher couple” would like some seed money to start another business. I think we will have to pay them a little as an incentive to make them stop the killing and surrender all the dogs to us. The number of the dogs are somewhat too many to handle but we are trying hard to make this happen. We can take 100 to our new shelter. We are trying to find a way to relocate 200 additional dogs. Bottom line is we will shut this dog farm down and save all the dogs at this location. We must do this in order to designate the city of Bucheon a “dog meat free zone”. This is disgusting and Korea needs to put an end to it. Bless you, Nami Kim! this farm is so horrific nd the poor dogs look so afraid and sad. we all have to help Nami in this fight. we cannot be tolerant with such cruel nd inhumane butchers! Ne rien lacher…!!! Vous et votre équipe sont formidables…Il faut que cela cesse..!!! 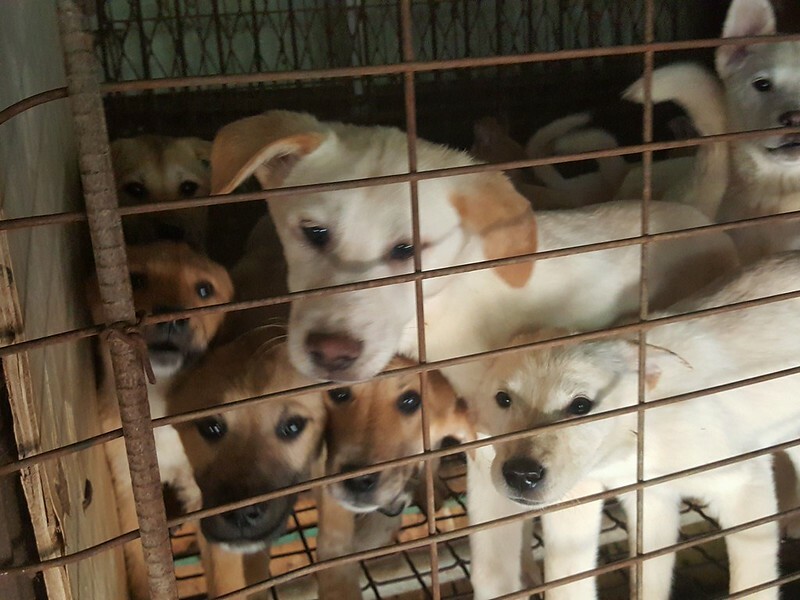 God Bless you – thank youi for saving the dogs – why dont we all work hand in hand to help shelter the other 200 dogs, help feed them and take care of medications – something like a little donation from people who care. 5 dollars wont hurt….Please keep me posted. God Bless all of you who are dealing with this awful situation. I am constantly sharing your posts on social media to get the word out. My prayers go with you in your efforts to put an end to this heartless & cruel industry. These poor animals need immediate rescue. What a disgrace. This Government should be ashamed for letting their people do this to this pets. Almost every household in the U.S.A. has a dog as a family member. The U.S.A. Hates this Country because of their heartless Government. Nami Kim and her team are doing an amazing and very difficult work. Can you imagine her courage and the stamina that all of these people must have to continue confronting these dog farmers and seeing the horrible conditions and the gruesome slaughterhouses. I don’t know if I would have the strength to go on, but I am so honored to be able to help in some small way from the USA by sharing and donating when I can. This is a worthy cause and a good group of people who are using the money for saving the dogs and not for themselves. 300 dogs is going to take a lot of support to save and transport and vet and find new loving homes. Please….anyone who reads this story, please share, sign the petitions, and donate! Even a little will help. You are a brave and I admire your efforts. God Bless you and your team for taking on this terrible trade! I pray for you and each and everyone one of those animals! Go watch over you all and grant you the strength to overcome these demonic people! Its disappointing that I cant sign petitions sent to me because I dont do facebook, twitter etc. I would like to help in other ways besides donating, but I can’t. I have friends the same – no facebook. PS dont pay for the 300 dogs, as it only teaches others to illegally operate and get paid (with blessing of the authorities). Then lots more poor dogs will be at great risk of being tortured and eaten. Make THEM pay a fine, not the other way around. Nami and the official should just take the dogs as the couple broke the law and should relize these dogs have to be looked after and fed. What can they do to stop them? Bless you Nami! I will donate. You are truly an angel for these dogs!! I hope it is a final end for killing puppies!